Editor’s note: Dr. Sabrina Tassy-Lewis is executive director of St. Alban’s Child Enrichment Center. 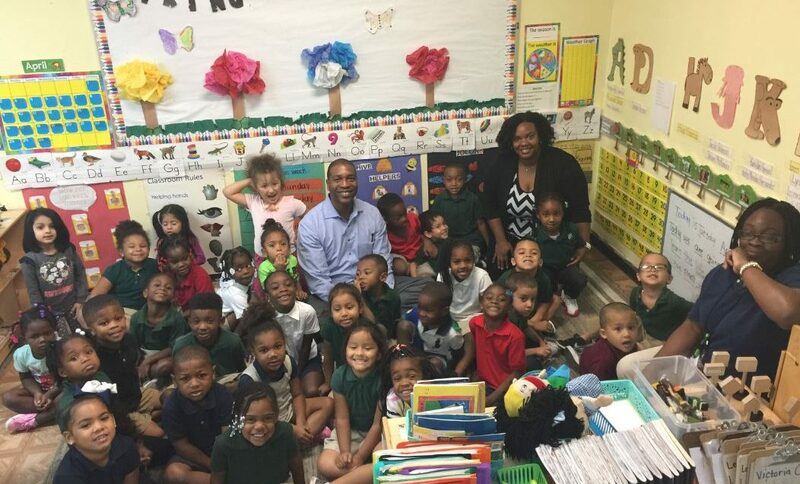 The nonprofit has provided early childhood education services to children and families in the Coconut Grove and South Miami communities since 1949. It was among The Miami Foundation’s first grantees and a recipient of our 50th anniversary “Legacy” Signature Grants. Sabrina completed an executive leadership program with a grant from our Miami Leaders program. She shared a bit about her experience with us. I grew up in Haiti. More than half of the country’s population lives under the national poverty line. Yet, despite their significant personal needs, I saw how the community of people around me cared deeply for one another, valued the “us” over “me” and exuded cultural pride. These lessons stayed with me even after I left. My family moved here at the age of seven. It was my first taste of the “Miami experience” as the melting pot of the world. I was exposed to a new language and people of all nationalities. Two years later, my family left to Broward, where I lived most of my life. Nonetheless, Miami always drew me back, whether for work or to hang out with friends. Working in Miami allowed me to develop a unique perspective on the needs of people in this community and to understand the mix of cultures that makes this city unique. I am a licensed psychologist with a deep passion for helping youth reach their full potential and achieve success. I remember growing up and seeing friends and classmates struggle with isolation, depression and social issues. At that moment, I knew wanted to effect change in others’ lives by working in the mental health community. What I did not know was how that would take form. My journey eventually led me to St. Alban’s Child Enrichment Center in 2011, where I became the associate director. I remember walking through the doors of St. Alban’s for the first time. A sense of family, history and cultural pride immediately hit me. The people at St. Alban’s commonly refer to themselves as “Groveites” and often take on that sense of “us.” I felt at home. While Miami is a huge city, Coconut Grove has a small-town feel where everyone knows their neighbors, people go to the same schools and families know each other by name. In 2012, I took on the role as St. Alban’s executive director. With that transition came a great responsibility to carry the organization into its next chapter. I sought for ways to become more effective in my work and learned about the Miami Leaders program. I applied and was thrilled when they selected me for a scholarship to attend Columbia University’s Developing Leaders Program for Nonprofit Professionals in 2015. This program forced me to look inward and reflect on my role and what I needed to change in order to achieve the lasting impact I sought. It helped me better evaluate and plan ahead for the organization. I became more introspective in understanding how my work impacts the work of those around me. I gained a deeper understanding of how my approach to conversations, assignments and change impacts others’ effectiveness. It taught me to listen more and keep my interactions in line with what staff needs rather than what I think they need. I also learned about my communication style, which tends to the social side, and to connect more directly with those who need it. In addition, I gained insights on branding and how to improve the overall message that others see and hear about our organization. Following this program, we redesigned St. Alban’s logo and website to better reflect where we are now and where we are going in the future. Looking ahead, we will ensure St. Alban’s long-term sustainability by creating partnerships with various entities and undergoing a major capital improvement campaign. My hope is that St. Alban’s is not only a high-quality early childhood program in Coconut Grove, but that it becomes a model for other early childhood centers throughout the country. The goal is to take actions today that will carry St. Alban’s work forward and expand its impact into the future, helping the lives of children and families for generations to come. Sabrina Tassy-Lewis is executive director at St. Alban’s Child Enrichment Center. Are your grant programs for specific educational programs in the community? I have a 501c3 non-profit animal rescue and would be interested in taking continuing information in dog training and behavior education: a grant would really help me cover these expenses. Would this be covered? If there’s a class you’re interested in, we’d encourage you to apply! I would like to know more about the Miami foundation.